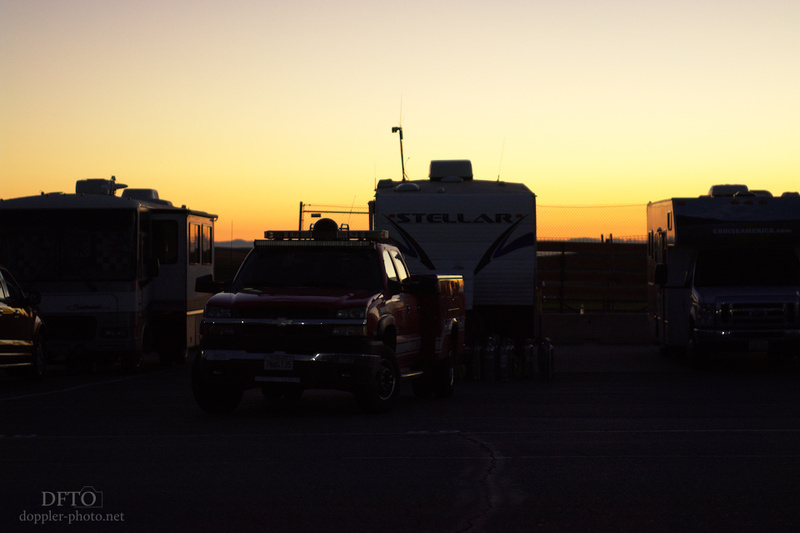 As the race-day sky turns from black, to blue, to red, orange, and finally, sunlight, the members of the Safety crew awake from their last moments of guaranteed sleep during the race. 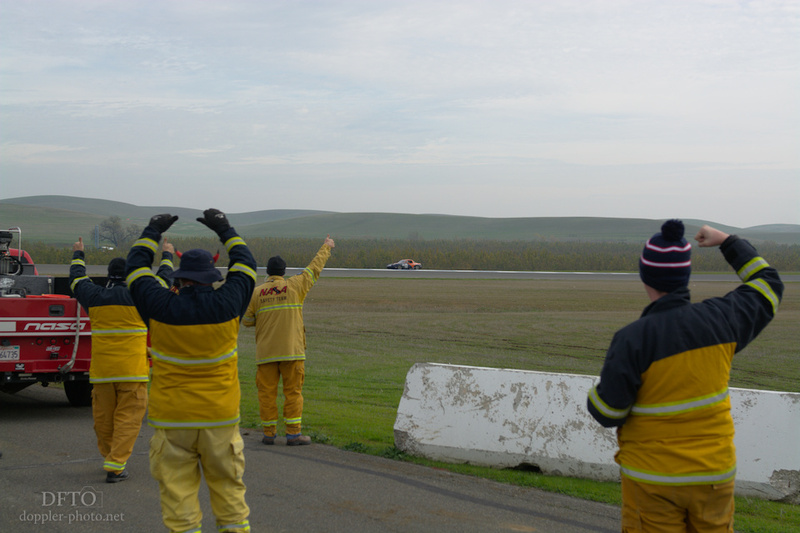 Safety is the last of the trifecta of teams that represent Race Control outside of the tower: the pit marshals are the eyes, ears, and voice along pit lane, and the flaggers fulfill a similar role around the track. Safety is the muscle. When a car has to get moved, or a dangerous situation needs to be disarmed, Safety is called to the scene. And just like a fire company, they rest between calls, and they work when they're called. But during the 25, they're on call all race long. As with the other two groups, the day begins with a coordination meeting. 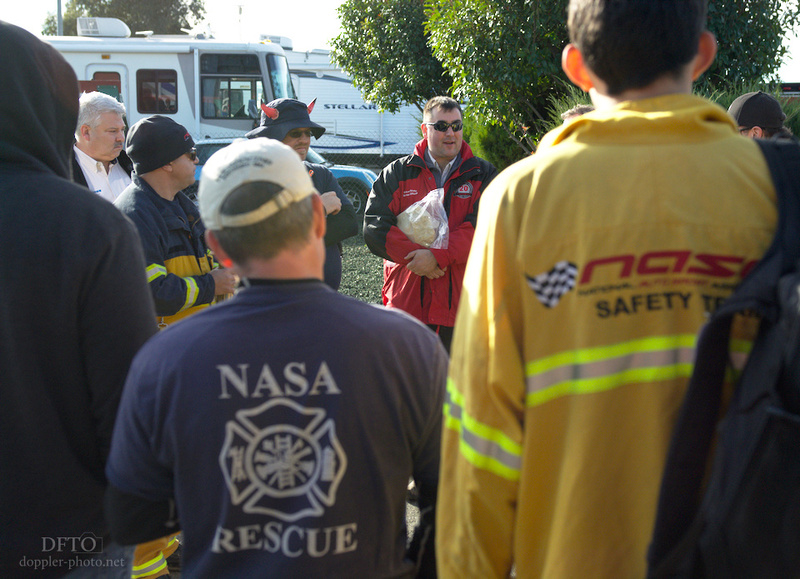 Here, NASA Executive Director Jerry Kunzman (far left) looks on as Robert (center, red jacket), one of the race directors, speaks during the meeting. After Race Control's piece, the Safety crew went over some logistics, and then divvied up work assignments — who's working with whom, who's going to be operating which truck, and so on. The Safety crew ceremonially starts the race standing in a narrow line in the middle of the track, as the race drivers start their engines and drive past in double-file for the parade laps. After the cars all pass, Safety breaks for their vehicles to catch up to the parade, or to otherwise get into position for the green flag. Most of the calls are quick and fairly straightforward. Generally, a car needs a tow back to the pits/paddock for some reason. 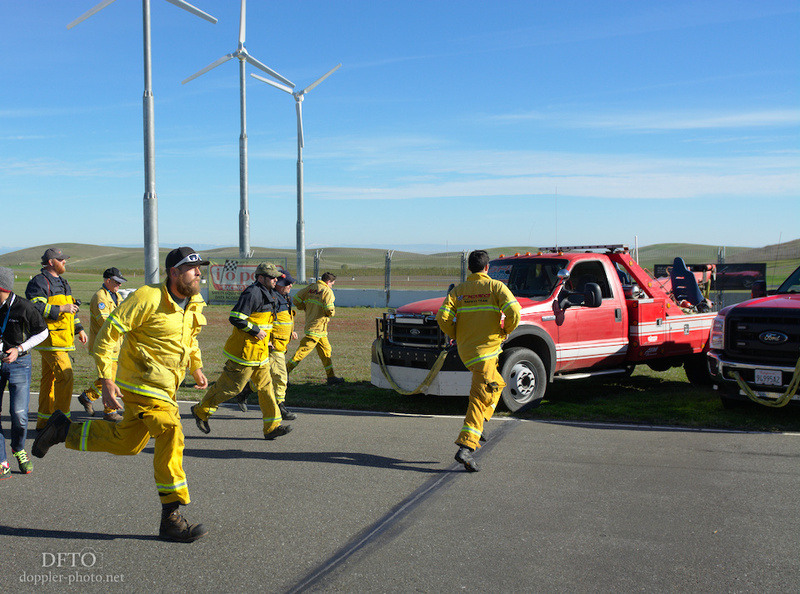 When possible, the Safety truck respond to calls in pairs — the lead truck communicates with the affected vehicle and sets up the tow or whatever else is needed. The trailing truck sets up in a blocking position so that the folks who are out of their vehicles are a bit safer. Every once in awhile, the call is for something bigger. In this case, the #90 rbankracing.com/ShopForAPuppy.com Integra got sideways near Turn 10, caught a wheel, and rolled. A bigger incident will trigger a larger response (and in cases like this, the flaggers will help to inform Race Control of how much of a response is needed). If the driver might have gotten shaken up, one safety vehicle will generally take the driver away for a medical evaluation as the other trucks continue the cleanup work. 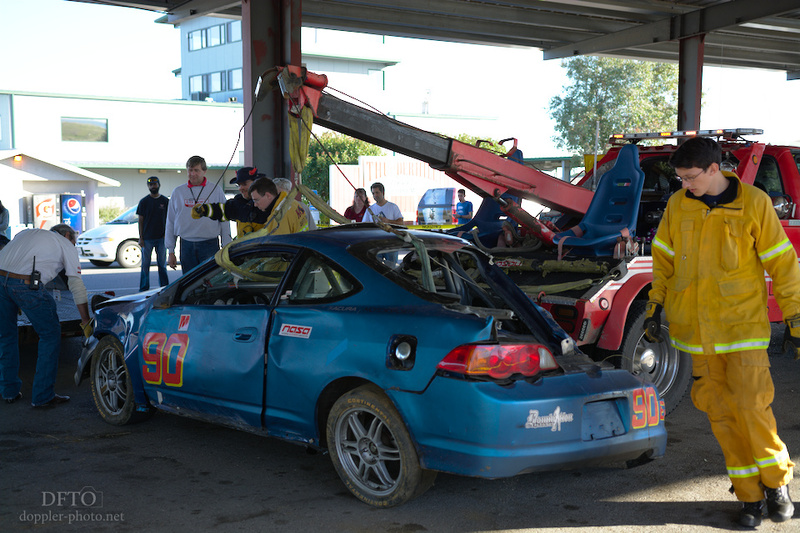 Cars that were retired due to collisions are delivered to impound for inspection, and when needed, Safety also provides some assistance in loading the damaged vehicles up for transport by the race team. Because the Integra's rear suspension was badly damaged, it was easier to lift the car in place, and then back the trailer under it. Large incidents will typically also cause a full-course yellow. The Safety car will deploy to keep track speeds low, and to prolong the gap where the Safety crew doesn't have to worry about oncoming vehicles. 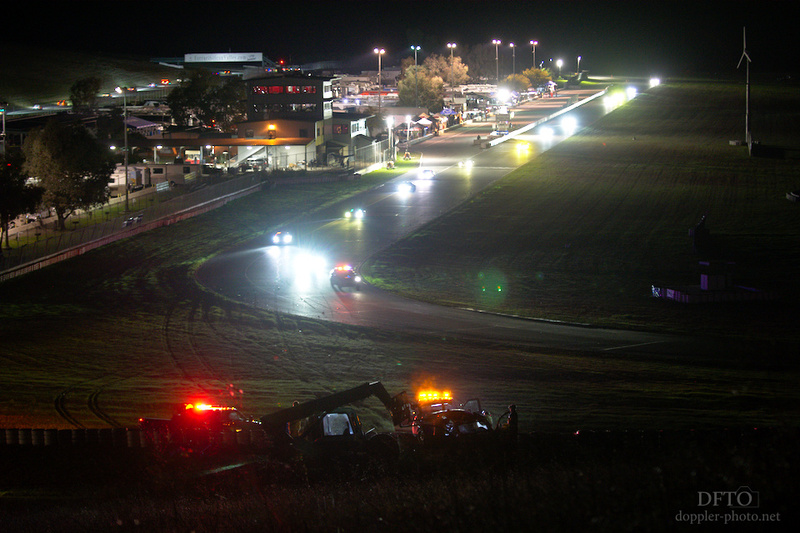 In this case, the #62 Strom Motorsports BMW M4 failed to slow down at the end of the front straight. It rear-ended the #70 Mazda USA-supported ND Miata before finally parking on top of a tire wall. As the hours march on and the fatigue steadily grows, the Safety crew more vocally demonstrates their appreciation for, in this case, satisfactory off-road skills. 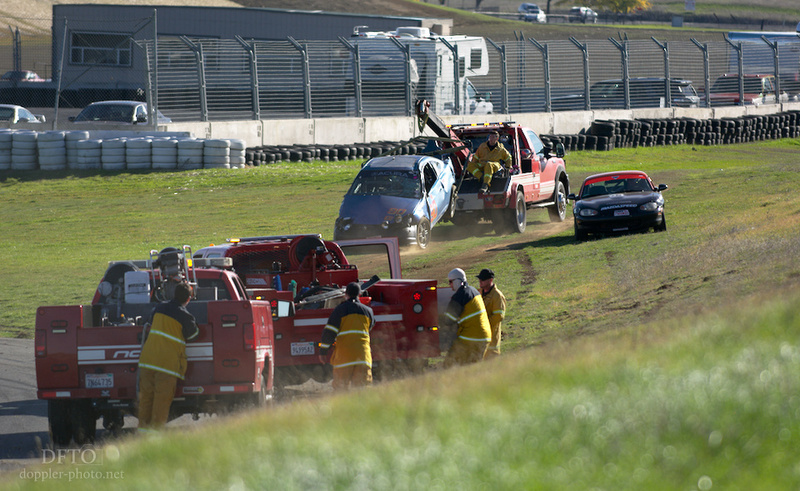 The #23 RJ Racing Miata went off-track and got stuck on the dew-slicked grassy hill outside of Turn 6. 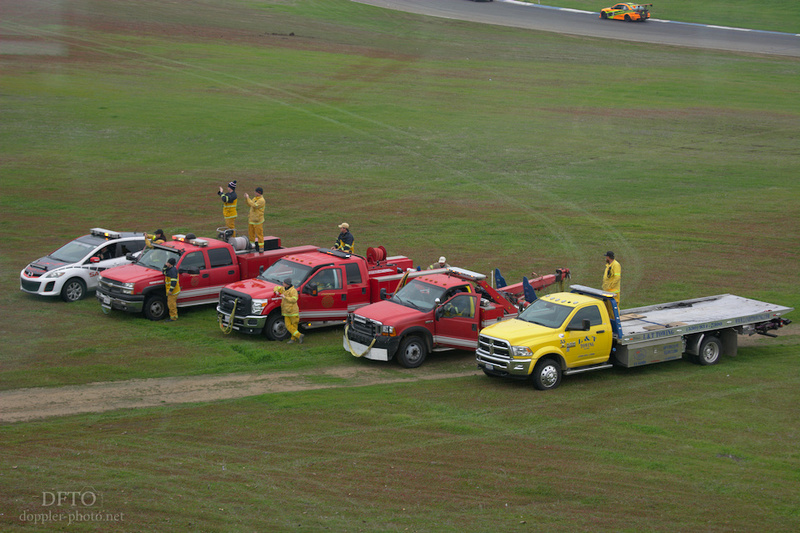 But after a fair amount of tire-spinning, and some encouraging shouts from the onlooking Safety crew members, it managed to crawl back to the track surface without any trucks having to roll. Mark it down as a success. At last! As with the green flag, the Safety crew also lines up for the checker. Next time, we'll take a peek behind the curtain at the group that coordinates the whole dance: Race Control! Click here to subscribe, and don't forget to share with friends.